I asked the members of my food class called A Matter of Taste-Food and its Many Attractions – what they loved to eat and what they hated. It’s amazing how much energy people have for the foods they don’t like! Next on the list were beets, followed by Brussels sprouts. That proved to be a rallying call and I pledged to bring in at least one dish from each ingredient to see if we could have a few conversion experiences. Crush garlic into processor and add cumin, lemon juice and hot sauce. Add beets and chickpeas and process until smooth. Add oil for a bit more depth of flavor. Mix all ingredients and serve. You can also make ahead and let flavors blend. 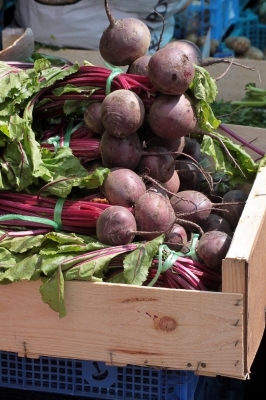 Cook diced beets with sugar and ginger over medium heat for 30 minutes. Add chopped lemon and orange and continue cooking until slightly thickened – stir to prevent sticking – about 30 minutes. Put in jar and keep refrigerated. You can process in boiling water if you want to keep them longer.